From the Star Wars trilogy! Faithfully recreated prop replica of Darth Vader's helmet. 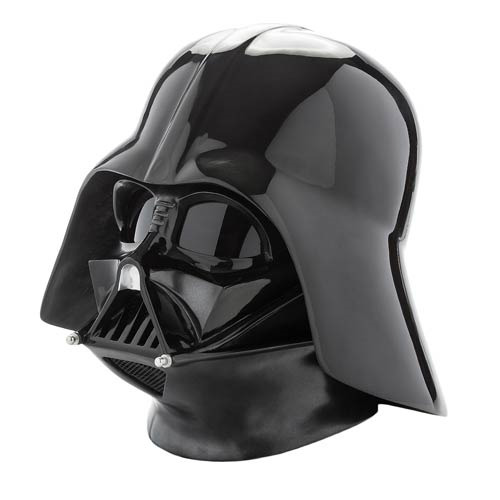 Add to your impressive Star Wars prop replica collection with this amazing version of Darth Vader's helmet! Utilizing the best features of the various helmets made from the classic Star Wars trilogy, this Star Wars Darth Vader Standard Helmet Prop Replica features faithful detailing, with the two-tone paint scheme from Star Wars: Episode V - The Empire Strikes Back. The helmet has been made from fiberglass construction, and includes "reveal" style greebles and "vents" on the upper forehead of the facemask, which are hidden by the dome when worn. Turned-aluminum tusks and bubble lenses continue the authentic look, while the helmet dome locks into the faceplate via an exacting magnetic and keyed locking mechanism that makes for perfect alignment every time. Complete with adjustable helmet / suspension rig that fits a wide variety of head sizes, the helmet is one-size-fits-all and even features a lined, breathable inside mesh for the helmet wearer's comfort. Helmet can accommodate up to hat size 8, or a 24-inch circumference.